I’ve only had real fettuccine alfredo once. I went through a phase about 10 years ago where I used to eat fettuccine alfredo Lean Cuisines a few times a week. (Don’t judge me!) And then I thought, “Hey, this stuff is pretty good! Fettuccine alfredo is my thing now!” So when Chris and I went on vacation to Michigan (which, by the way, is what people from Chicago do–they go on vacation to Michigan) and got dinner at an Italian restaurant, I thought I’d order their fettuccine alfredo. The waiter brought it out and I swear there had to be two pounds of pasta in that bowl. Two pounds of pasta bathed in super rich alfredo sauce. And cheese! Lots of cheese. I don’t think I’ve ever felt so sick after eating a meal in my life and I barely even put a dent in that pasta. Real fettuccine alfredo–never again! But I still love a good creamy pasta sauce. Just not so heavy. Cashew cream is perfect for this. It’s creamy and rich, but it doesn’t make you feel sick after eating it. If you’re skeptical about the whole cashews-as-dairy-sub thing, give it a try. I was a skeptic too, but it really works. 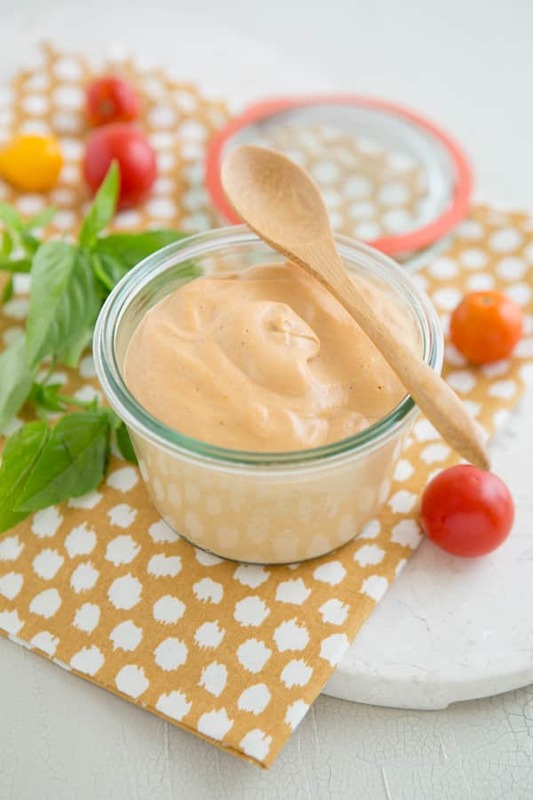 This alfredo sauce is vegan and soy-free; I like to use a little homemade veggie broth in mine for a boost of flavor, but if you want to make a raw version of the sauce to serve over zucchini noodles, it’s easy to do by substituting the broth with filtered water and using dehydrated tomatoes instead of oven-dried ones. 2. Put them on a baking sheet, cut side up, and drizzle or spray them with a little olive oil. 3. Sprinkle the tops of the tomatoes with salt and pepper. 4. 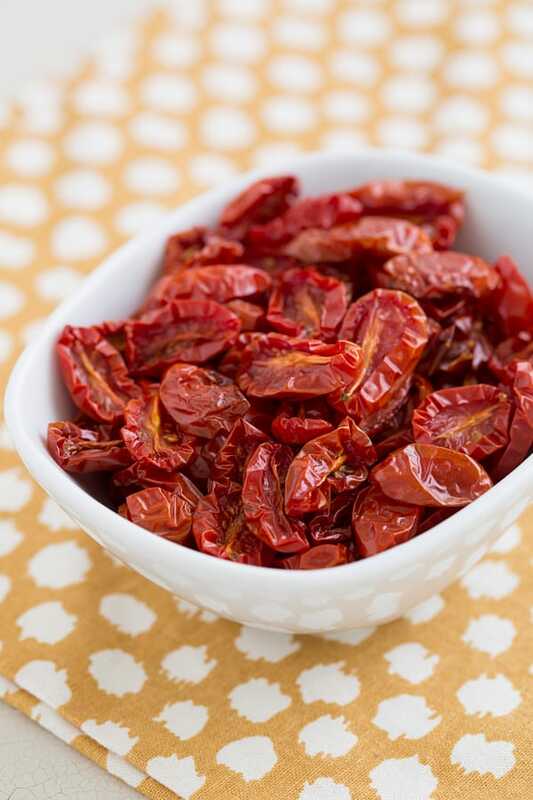 Bake the tomatoes at 225ºF for 2-4 hours, until they’re as dry as you want them to be. Easy! You can either put the tomatoes in a jar, cover them with olive oil, and refrigerate them or you can pop them in a freezer bag and freeze them until you need them. I love adding them to pasta, pizzas, and salads. 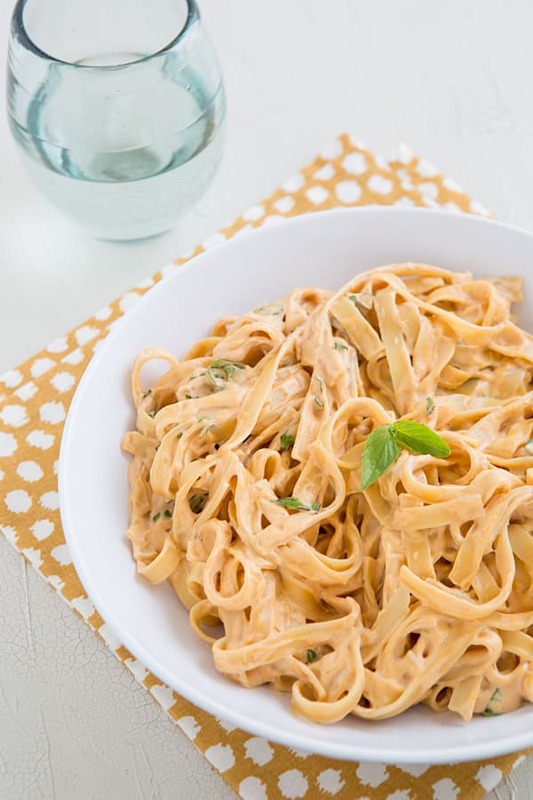 You’ll never guess that this rich, creamy Sun-Dried Tomato Alfredo Sauce is dairy-free! Combine the cashews, broth, tomatoes, nutritional yeast, lemon juice, and garlic in a blender or food processor. Blend on high until the sauce is completely smooth. Stir in the basil and season with salt and pepper to taste. Transfer the pasta to a large bowl and toss it with the alfredo sauce. If the sauce is too thick, add a tablespoon or two of cooking water from the pasta. I’m sure store-bought sun-dried tomatoes would work in this too, but I haven’t tried it myself. If the tomatoes you buy are especially dry, let them sit in warm water for a few minutes to plump them up. I made this! the taste is good but mine came out a stickier creamy consistency than what it appears in the recipe. I think next time I’ll add more stock to the blender? Would that make it a thinner creamer consistency? Just made this today!!! Meatless Monday. It is very good, even though hub’s isn’t fond of Meatless Monday & Leftover Tuesday, never has he had a “Vegan” Monday. We really enjoyed it. I also added broccoli and cauliflower, with the sun (oven) dried, fresh tomatoes. I am however, not because of the recipe quality, but the cost of fresh cashews, thinking about using chick peas in place of the nuts. Any thoughts? We’ll just call it Hummus Fettuccini Alfredo!!! Thanks you for the wonderful recipe…even took some to work for the “doubting meat eaters”! Vegenaise makes a wonderful “alfredo-type” sauce with absolutely NO effort. But, I would suggest half & half because Vegenaise has a LOT of calories. The best sauce! I recommend it to everyone!! I would like to make your oven-dried tomatoes, and the alfredo sounds great, too. Have you frozen any of the tomatoes? I have to wonder if they thaw out mushy? I have made cauliflower alfredo from cradlerockingmama.com and it was very tasty. Oh my god, this was so good!! Thank you for the recipe! Greetings from Czech republic!